We wanted to find out more about Mazda’s brand-new RT24-P race car, so we handed a mic to Mazda North America Director of Motorsports John Doonan to explain everything that went into it. It’s a completely new car from last year’s prototype, and we got up close as the team was assembling their two cars for today’s Rolex 24. If you thought your buddy’s V8-swapped Miata was ridiculous, this Mazda is on a whole ‘nother planet of insanity. The RT24-P’s 4-cylinder, single-turbo engine puts out 600 horsepower in a car that’s barely over 2,000 lbs. There’s lightweight carbon fiber as far as you can see, and the car’s curvaceous shape and narrower track for this year allowed it to set the fastest straight-line speed at the Roar Before the 24 practice weekend. The uniquely curvy Mazda RT24-P looked off-pace in qualifying, but a team representative said they ran it very conservatively. 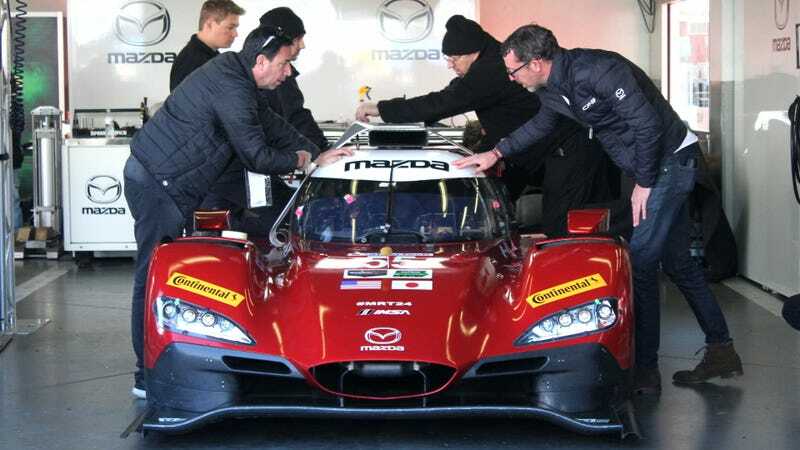 Reliability has been a big issue for this Mazda team in the past, so those of us who’ve seen the Mazdas go fast and then blow up can surely understand. Because they’re using a very similar MZ 2.0T engine to last year’s, they’ve addressed many of the points of failure from last year. So, while they’re less worried about its reliability, but they opted to dial it back for qualifying regardless, ending up qualifying ninth and tenth in the top Prototype class. They’ve got 24 hours to make up those places, so why not? We’ll see how it goes over all 24 of those hours. Make sure to tune into Jalopnik’s Facebook page for more live-streams from the Rolex 24, as we go behind the scenes at America’s most infamous full-day-long race.